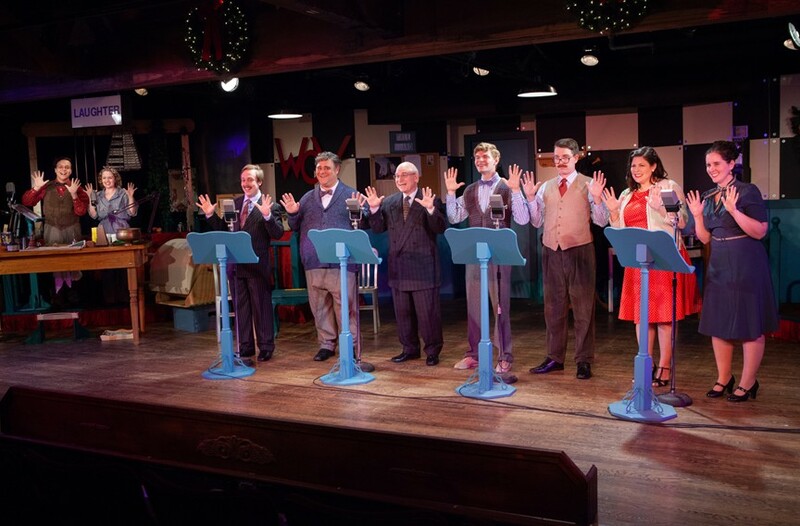 Audiences looking for a feel-good holiday show with four-part harmonies will love Swift Creek Mill Theatre’s “A 1940s Radio Christmas Carol” | Theater | Style Weekly - Richmond, VA local news, arts, and events. 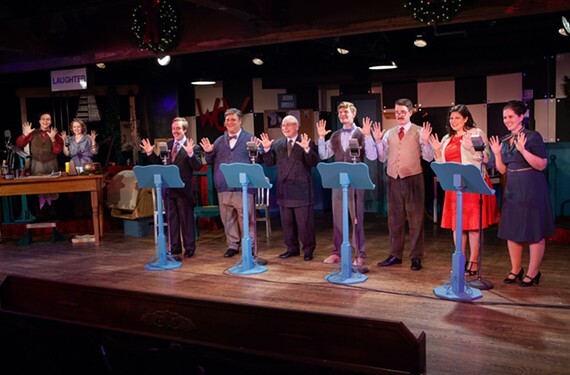 The harmonizing ensemble cast of “A 1940s Radio Christmas Carol” performs a radio show within the play. Audiences who prefer their holiday entertainment served with a side of nostalgia will love Swift Creek Mill's production of "A 1940s Radio Christmas Carol." 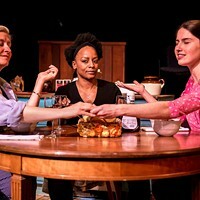 A sequel to Walton Jones' 1979 "The 1940s Radio Hour," this play returns to the gang at WOV, a small New York radio station. 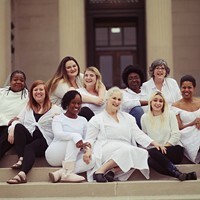 The Feddington Players have gathered in their new studio, located in the anteroom, just off the lobby of the Hotel Aberdeen in Newark, New Jersey, to air their version of the Charles Dickens' classic, "A Christmas Carol." They've brought in legendary stage and screen actor William St. Claire to portray Scrooge and everyone's excited. But the eccentric older actor's lack of radio experience, along with a series of new-studio hiccups, makes for a chaotic broadcasting environment. Characters fumble and stumble but ultimately work together to keep the show running, live on the air and in front of a studio audience. I love a good play within a play, and this one is a lot of fun. Director Tom Width's attention to detail is impeccable, as evidenced by the playbill within the playbill actors distributed in-scene. It features period-appropriate advertisements and performer bios for each of the Feddington Players, including a few telling signs of the time. Cliff Feddington's bio includes the quote "'bye bye and buy bonds'" and Margie O'Brien's performance is dedicated to her little brother, the late Pfc. Patrick O'Brien. World War II isn't the direct subject matter of this play, but the war looms heavily over everything and everyone, re-creating the atmosphere of the 1940s. This is woven into the script, of course, but Width has also taken great care to weave it into the technical elements of this production. The specter of the war can be seen in the incredibly detailed set, with its backlit signs telling audiences when to laugh or clap, in the old fashioned sound effects, all expertly created by actors Gordon Graham and Claire Gates onstage, and in Maura Lynch Cravey's excellent period costume design. Nowhere, though, is the wartime nostalgia more evident than in Shellie Johnson's musical direction. 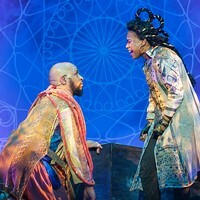 As "Toots" Navarre, Johnson's onstage accompaniment to the cast's impressive harmonizing is the backbone of both the play and the radio show within the play. This is a great ensemble, too. Standouts include Tara Callahan Carroll, who is perfect as Margie O'Brien, a glamorous and versatile songstress and voice actress. Bill Blair is perfectly cast as the aged but masterful William St. Claire, as is P.J. Llewellyn as shoe salesman turned radio show detective Fritz Canigliaro. Claire Gates is excellent, spunky and funny as Sally Simpson, a voice actress and sound effects artist who also works as a riveter. Kenneth Putnam shines as the affable Charles "Cholly" Butts, and I enjoyed Ian Page's deadpan-then-drunk Harold Mullins, stage manager to the Feddington Players. John Mincks was great as Little Jackie Sparks. Swift Creek Mill Theatre's "A 1940s Radio Christmas Carol" runs until Jan. 5. Tickets cost $40. swiftcreekmill.com.